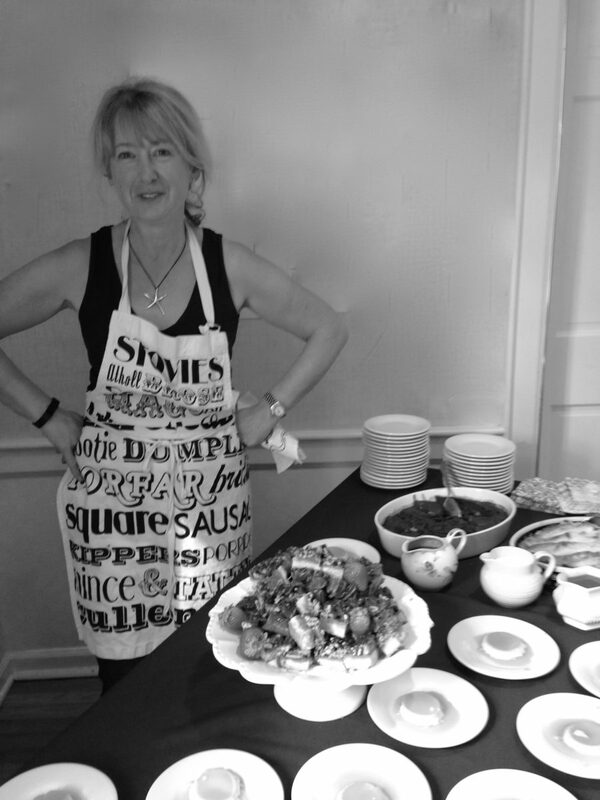 This is the lunch I served for the January 2015 Darien Community Association Woman’s group lunch. I think I cleaned out Whole Foods as I left with 192 sausages. It seem a perfect supper to serve up while we waited for the blizzard to hit. I mixed it up slightly and added some roasted yams and sweet potato for supper and left the mash plain. For the lunch at the DCA I tried out Colcannon, a fabulous mix of mashed potatoes, cabbage and scallions. Now I feel I should own up to my mashed potato obsession. If I eat out I generally look to see what comes with mashed potatoes, and then order that. It is probably linked to my celtic background, as Scots and Irish share a common heritage. The Irish do take their potatoes very seriously and it is not uncommon for them to serve up to three different types for one meal.. Bliss. 12 Irish bangers (from Whole Foods, or Trader Joe’s in the weeks leading up to St Patricks Day). Now obviously you can use any sausage for this dish, but Irish bangers are a non-fennel pork sausage. I always buy, and cook, more sausages as they are wonderful cold, great for breakfast or can be added to soups or pasta sauce. I cook my sausages in the oven. Place them on a baking sheet, pricking them twice on each side. Cook the sausages for around 30-35 mins, turning them halfway through, until they are a lovely dark brown. Heat a tablespoon of butter and a splash of olive oil in a large saute pan. Add onions and cook a medium heat stirring every now and then. After about 30 mins throw in a little thyme. The idea is to cook the onions slowly until they start to turn a dark golden brown, which takes anything up to an hour. Peel and boil the potatoes in salted water as for regular mashed potatoes. Add sliced scallions to milk in a saucepan and bring milk to the boil. Shred and cook cabbage in salted water until tender. When potatoes are ready drain them and then add butter and hot milk and mash well. Mix in drained cabbage and check for seasoning. place a large dollop of mash in the middle of a plate. Top with sausages, caramelized onions and baked beans. HP sauce would be great with this! she creates is delicious. The deserts that day should also be published. Martha, Thank you. If you look under DCA I have all the menus for the Woman’s group lunch with links to the recipes, not all are there yet but I am working towards it. Dessert that day was Sticky Toffee pudding and the recipe is already up.